Spotlight on Service: Lead Return Agent Jeffery R.
Enterprise Holdings Spotlight on Service: Alamo Greeter Ritchie W.
Spotlight on Service: Branch Manager Kyle E.
Lead Return Agent Jeffery R.’s goal is to create positive customer interactions. 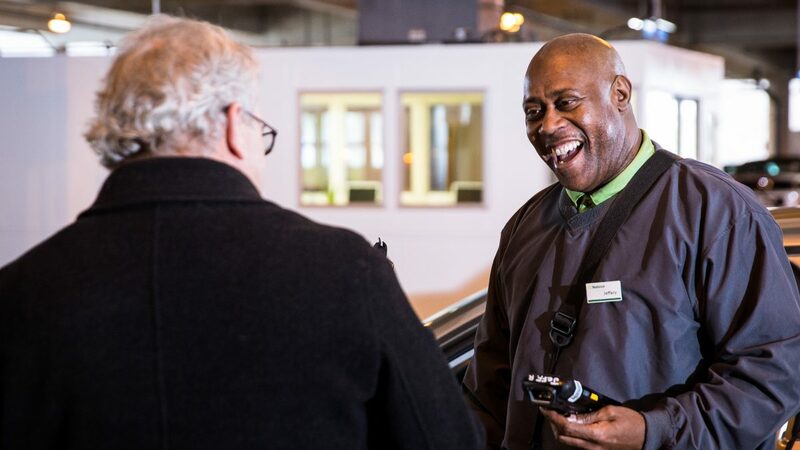 This was especially seen recently when he offered to drive a customer to Baltimore – Washington International Airport to help him catch his flight. The customer commended Jeffery for going above and beyond expectations. Q: What was it about this customer that signaled to you that you needed to go above and beyond for him? A: I could see how he was panicking when he returned his car. I just wanted to calm him down, and in the process of calming him down, I found out he was running late to get home to his family. That’s when I offered to take him over to the airport. I knew if I took him directly to the terminal, he would have a better chance of catching his flight. Q: What drew you to this position? A: When I first started, the return agent position was the only one available. I had no idea what a handheld computer even was, so I was nervous. After a few days, I started to get the hang of it. I also came to realize that I really do have a big impact in this role. I get the chance to interact with people from all over the world and be kind to them. This seems like a small contribution, but it pays big dividends in the customer service we provide. Q: How do you stay motivated to provide great customer service even after 13 years with Enterprise Holdings? A: I just love people, I always have. And I want to be the best at customer service. My two bosses make this possible. Area Manager Aaron R. and Group Daily Rental Manager Britt M. show confidence in me and my decision-making. They let me speak my mind, and they support me every step of the way. If your managers treat you well, they allow you to feel good about the value you bring to the business. And this allows you to excel in your position and pay it forward to your customers. We studied interior and exterior customer service a few years ago. Interior means you practice the exercise of kindness with your coworkers and your managers. That allows you to be kinder to your exterior customers. Q: In your opinion, what sets Enterprise Holdings apart from the competition? A: We are very focused on making sure all of our customers are completely satisfied with our service. The product is in many ways the same, so what differentiates us is the positive atmosphere we create. Q: What’s your favorite part about your job? A: Making people happy. I’m overwhelmed that I can make a difference in people’s lives when they are traveling. I have literally had people bust out crying saying, “You made my day. How did you know to be so kind?” I don’t ever want to be the bad guy. I want to bring some light to a person’s life. For someone to tell me that I made their day makes me feel good as a human being, no matter what life is throwing at me. I can be having a tough time at home, and I come here and forget all about that. Q: What three words describe your approach to customer service?